Many homeowners trying to troubleshoot or fix a furnace for the first time are surprised if they don't find a traditional "pilot light" (also known as a standing pilot). It's often expected that any appliance that burns natural gas or propane will include a tiny flame that constantly burns, which provides the source for igniting gas when the appliance's controls deliver fuel to the main burners. In reality, pilot lights are a thing of the past for all gas-powered furnaces, as well as or most other gas-burning appliances, such as stoves and water heaters. Today's furnaces ignite the gas through different technologies, known collectively as electronic ignition systems. 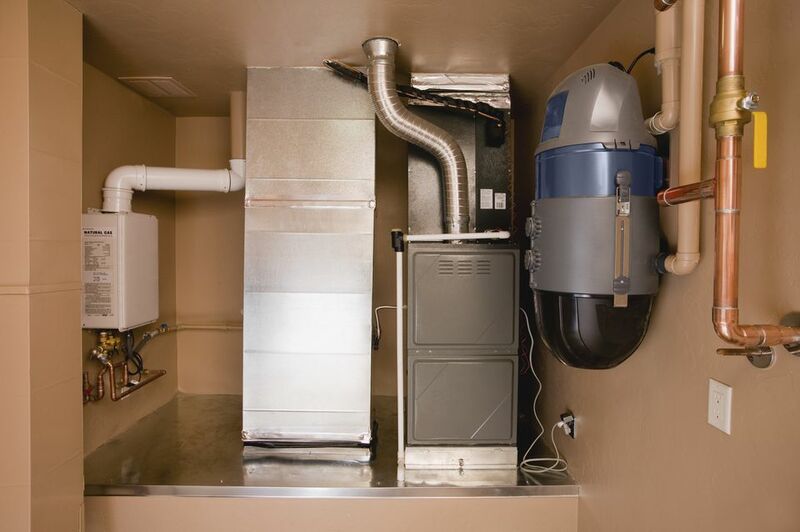 Depending on its age, your furnace is likely to have one of the following three types of ignition methods. You're probably familiar with a standing pilot light. It's a little blue flame that sits in front of one of the furnace burners and burns continuously. Hot water heaters, gas fireplaces, and old gas stoves also often have similar standing pilot lights. If your furnace has a little round knob on the gas valve with the words OFF/ON/PILOT, you have a standing pilot ignition. This is a relatively simple technology, although not very fuel efficient. A small heat-sensing device known a thermocouple makes sure that major gas flow is delivered to the main burners on the furnace only when it is kept warm by the presence of the pilot light. Occasionally a standing pilot light will need to be relighted, or a thermocouple will need to be replaced, but these are easy and infrequent repairs. If you have a newer furnace (or one with an AFUE rating above 80), it most likely has an electronic ignition system. One type of electronic ignition is an intermittent pilot. This system uses a pilot flame, but the pilot lights only when there's a call for heat from the thermostat. The furnace's electronic control board activates an electric igniter that uses a high-voltage spark to light the pilot. The pilot, in turn, lights the gas for the burners. Once the burn cycle is complete, both the burners and the pilot turn off. You can identify an intermittent pilot by its heavy-gauge wire leading to a device with a metal tip that is positioned next to the end of a small gas line, which supplies the pilot flame. Most of today's furnaces with electronic ignition have a hot surface igniter or HSI. This is a simple part consisting of a ceramic fork or tongue attached to a squarish plastic base with two wires. The igniter sits in-line with one of the gas burners. When there's a call for heat from the thermostat, the fork heats up until it is red-hot. The gas valve then opens, and the gas is ignited by the glowing igniter. Hot surface igniters burn out over time, but they are easy to replace. You can usually check to see if a hot surface igniter is working simply by looking through the louvers of the front cover when there is a call for heat. Igniters glow brightly, so if you don't see any light, something is wrong. On the other hand, if the igniter never stops glowing, there's a problem with the furnace's electronic control board. The main problem with standing pilots is that they waste gas, to the tune of about 4 to 5 therms per month. (A therm is the unit of measure found on most people's natural gas bills.) At the national average of around $1/therm, that works out to $4 to $5 per month or $480 to $600 over a 10-year period, just to run the standing pilot light. The other problem with standing pilots is their tendency to go out, usually when it's windy or when the orifice on the pilot supply line is blocked. Electronic ignition systems, on the other hand, may go many years without any need for attention. Is It a Bad Idea To Burn Fiberboard?